The GDPR platform consist of three parts; the GDPR platform management interface (management studio), the GDPR platform datahub and the GDPR data access portal. The management studio interface enables you to edit configuration settings of your GDPR platform and access its datahub where all your GDPR data is collected, connected and stored. The GDPR data access portal is the public facing interface of the GDPR platform - this is where the end user - data subject in GDPR lingo - can log in and manage their GDPR requests, data and consents. 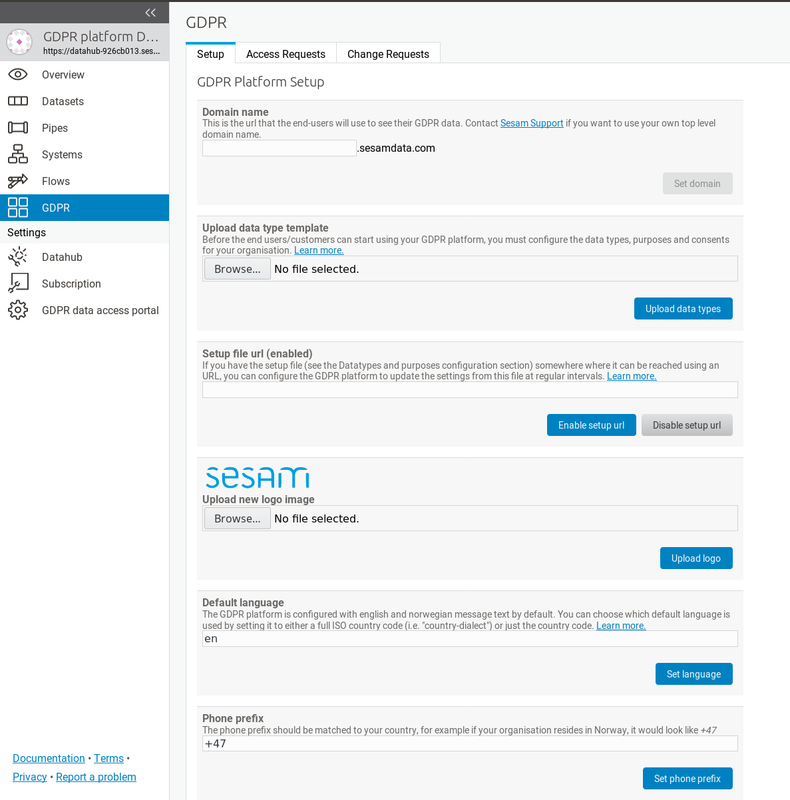 You can access the GDPR platform management studio by logging into the Sesam portal and clicking on your GDPR platform subscription. 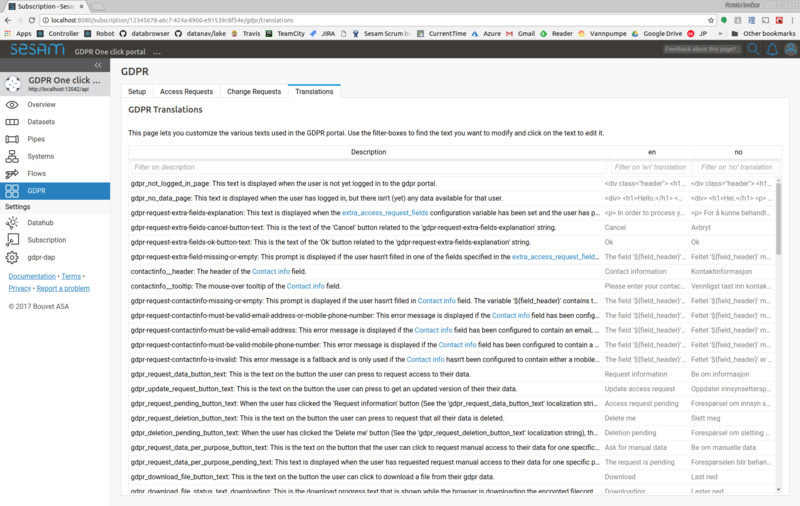 This will open the management studio GUI for your GDPR platform and datahub. Before you can start using your GDPR platform, there are a couple of configuration elements that you might want to set up first. This section allows you to upload a "Data type template" file (an Excel spreadsheet) to the GDPR platform. See the GDPR data types and purposes configuration section for more details. If you have this "Data type template" configuration data file somewhere where it can be reached using an URL (for example as a shared file in Dropbox, Google Drive, One Drive or something similar), you can configure the GDPR platform to update the settings from this file at regular intervals. By default this is at midnight UTC. By default, if a setup file has been specified it will be updated at midnight UTC. If you are unfamiliar with cron expressions, you can read more of how they are formatted in the Cron Expressions document. You can choose a custom logo image to display on your GDPR data access portal in the "Upload new logo image" setup section. The uploaded file will replace the default (or current) GDPR data access portal logo immediately when saved. If your language is different than the default norwegian and english locale, you can add additional translations by using the translation GUI. Note that for some of the strings, changes will not affect already emitted notifications or data objects - only new ones. To add support for a new language you first set the default language to the new language. A column for the new language will then appear in the table of localization strings, and you can fill in the strings for the new language. By default, the GDPR data access portal will ask end-users to authenticate themselves by supplying a phonenumber or and email address. A one time password is then sent to the phonenumber/email address, and the user can enter the password to log in. Sometimes this isn't the best way of authenticating the end-users. Perhaps you already have a login-system in place that you wish to use, or you wish to authenticate with something other than a phonenumber or email address. To handle such cases, the databrowser can be configured to authenticate with an OpenID connect authentication provider. OpenID connect is a authentication standard that is widely supported ( for instance by Goodle and Facebook). A unique id identifying the provider. This parameter is user-selectable and can be set to anything. The only requirement is that each provider_id must be unique. The id the data access portal is registered with at the authentication provider. The secret the data access portal uses to authenticate itself with the provider. to use as the "user_id" value. Defaults to "sub". Often, the "sub" claim contains a non-human-readable id, so it is usually better to use some other (unique) claim instead. For authentication against google, "email" should be used. For authentication against login.microsoftonline.com, "upn" should be used. to use as the "contactinfo" value in the returned user_info dict. Defaults to "email". If true, users with unverified email addresses are allowed to log in. Default true. This can be set to false for authentication providers that are based on the user's email address, and that don't already verify the user's email address. neccessary or doesn't work for some reason (which is the case for the preprod environment from bankidnorge.no, for example). In such cases the user_id, etc is extracted from the IDToken (http://openid.net/specs/openid-connect-core-1_0.html#IDToken) instead. The openid scopes to request from the provider. Defaults to "openid profile email"
The GDPR portal redirects the user's webbrowser to the authenticationservice's login-page. The authenticationservice redirect the user's webbrowser back to the GDPR portal with an authentication-code in the url. The "provider_id" is the id you specified in the "authentication_providers" configuration option. In some cases the authentication provider doesn't provide a phone number or email address that the user can be reached on. This can be the case when the user is authenticated via BankID. Since the GDPR platform needs a way to send notifications to the user, the GDPR data access portal can be configured to require the user to manually enter the contact information when making an data access request. 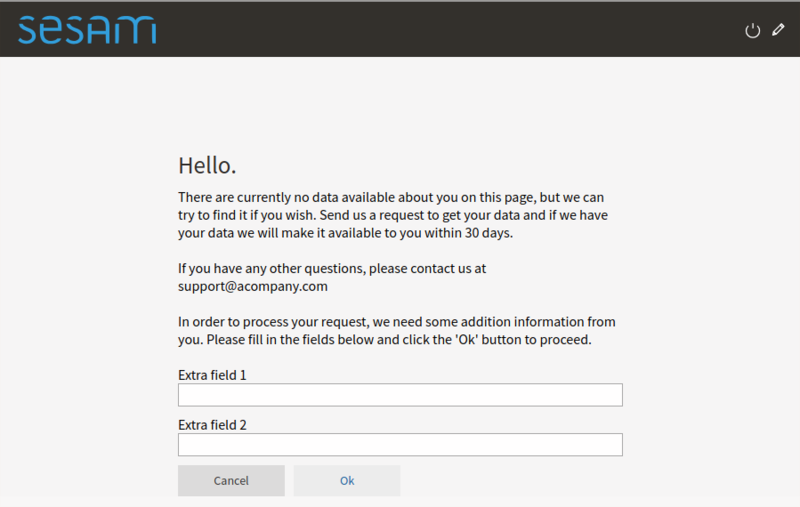 The value of the configuration option is a comma-separated list of the contact information types the user can specify. Possible values are "email" and "mobile_phone". If more than one type is listed, the user can choose which one to specify. en-contactinfo__tooltip=Please enter a mobile phone number or an email address. no-contactinfo__tooltip=Vennligst tast inn et mobiltelefon nummer eller en epost addresse. Technical details: When the user enters a phone number, it is validated using the regular expression in the "otp_valid_mobile_phone_number_regexp" config option in the "authentication" section. Email addresses are validated using the "otp_valid_email_address_regexp" config option. This is the list of extra fields that the user (aka the data subject) must fill in when making a gdpr access request. By default this list is empty, but in some cases it can be desirable to have the user add additional information. Example usecase: the user authenticate via a phonenumber, but has to also specify their date of birth when making an access request. This enables the data controller to double-check that the phonenumber is correct. Each field id must be some unique subject identifier. The field id will used to look up the field's "header" and "tooltip" texts in the [localization] section. © Copyright 2018, Sesam. Created using Sphinx.